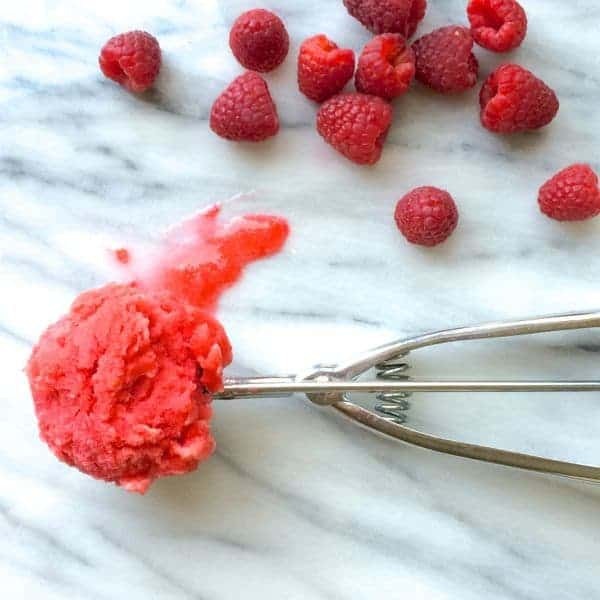 Ripe raspberries are pureed with fresh lime juice and ginger simple syrup to create this cool and refreshing sorbet that is not only delicious but easy on the waistline. Summer is right around the corner and I couldn’t be more excited. After an extremely brutal winter, I plan to soak up every minute! When my friends at Driscoll’s asked me to create a dessert recipe, I knew immediately that I wanted to make a sorbet. When the weather warms up, I love nothing more than ending my day with a tart, tangy and sweet raspberry sorbet. In fact, indulging in a little dessert at the end of each day is one of the main reasons I am able to maintain long term healthy lifestyle habits. Believe it or not, homemade sorbet is surprisingly easy to make. Since it can be made well in advance, it is also ideal for summer entertaining or casual backyard get-togethers. 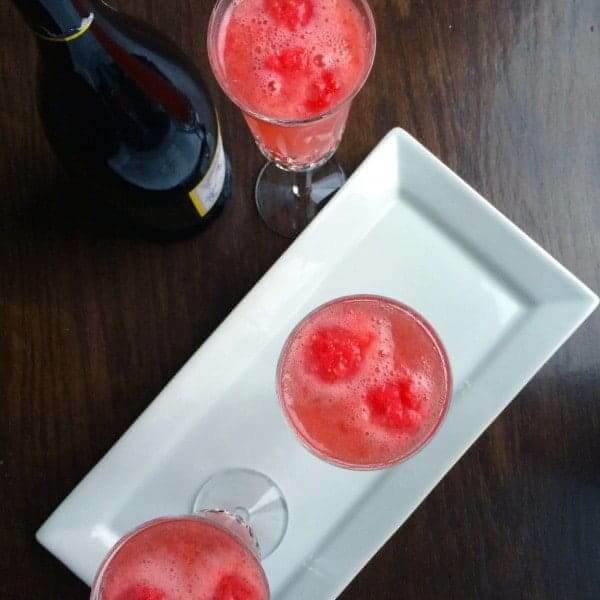 My Raspberry Ginger Sorbet balances the fruitiness of the raspberries with bright lime juice and spicy ginger. 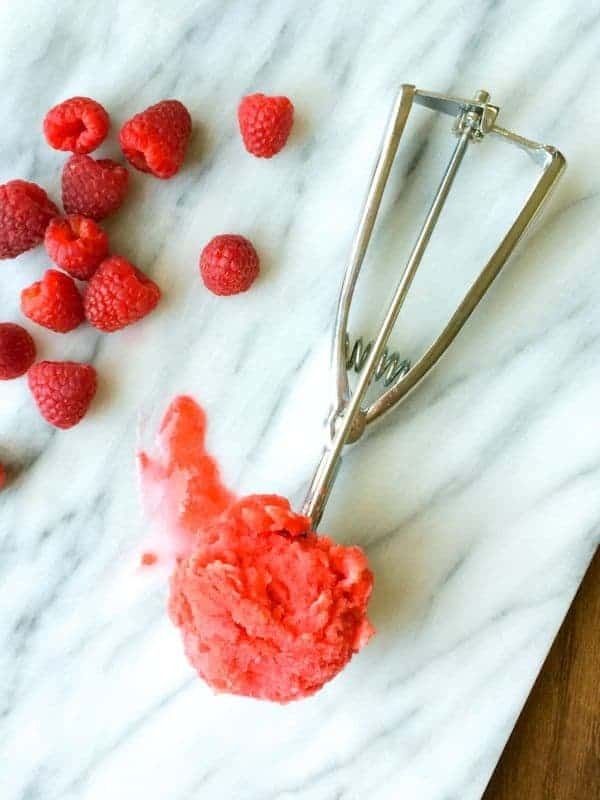 Driscoll’s raspberries are the star ingredient in this dessert and I like to let the natural berry flavor shine but you can add up to ½ cup additional sugar to the simple syrup for an even sweeter sorbet. Likewise, the more sugar you add, the smoother the end result. Personally, I would rather have smooth thighs than smooth dessert. My son typically eats raspberries by the handful but as you can tell, he loved this sorbet just as much as he loves eating the berries. 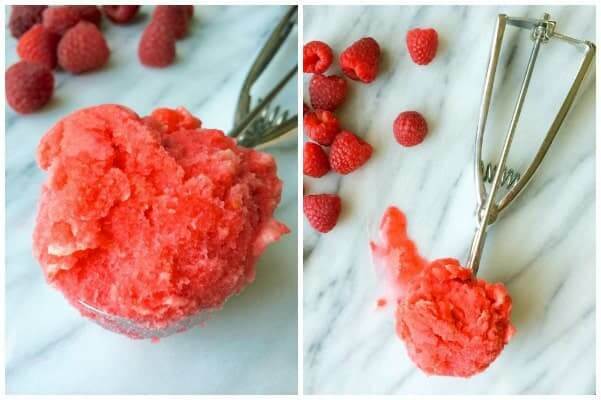 Ripe raspberries are pureed with fresh lime juice and ginger simple syrup to create this cool and refreshing sorbet that is not only delicious but also easy on the waistline. Heat water and sugar in a small saucepan over medium heat and whisk until sugar is dissolved, about 3 minutes. Remove pan from heat and add sliced ginger rounds. Let steep until slightly cooled, about 30 minutes. Puree raspberries, lime juice, fresh ginger and salt in a high speed blender or food processor until smooth. Place a fine mesh strainer over a bowl and press raspberry mixture through with a rubber spatula to separate the liquids; discard solids. Once simple syrup has cooled, strain over same bowl and stir to combine with the raspberry liquids. Place raspberry-ginger mixture in a bowl, cover with plastic wrap and refrigerate until cold, about 4 hours or over night. Pour mixture into ice cream maker and freeze according to manufacturer’s instructions. I like to let the natural berry flavor shine but you can add up to ½ cup additional sugar to the simple syrup for an even sweeter sorbet. Likewise, the more sugar you add, the smoother the sorbet. You can find my recipe for Raspberry Ginger Sorbet over on the Driscoll’s website along with many other delicious raspberry dessert ideas! Disclosure: Driscoll’s has compensated me for my time to create this recipe. Thank you for supporting the brands that make The Lemon Bowl possible. As always, all thoughts are 100% my own. Hi Liz! I absolutely love the addition of the ginger in this sorbet!! love and pinned! Perfect for summer! A bowl of sorbet sounds like the perfect refreshing after dinner treat! Plus love all the nutrients from the raspberries. Ginger and Lime sound like a great addition to the raspberry sorbet. I love a little tang and not a super sweet sorbet. Pinned and look forward to trying! 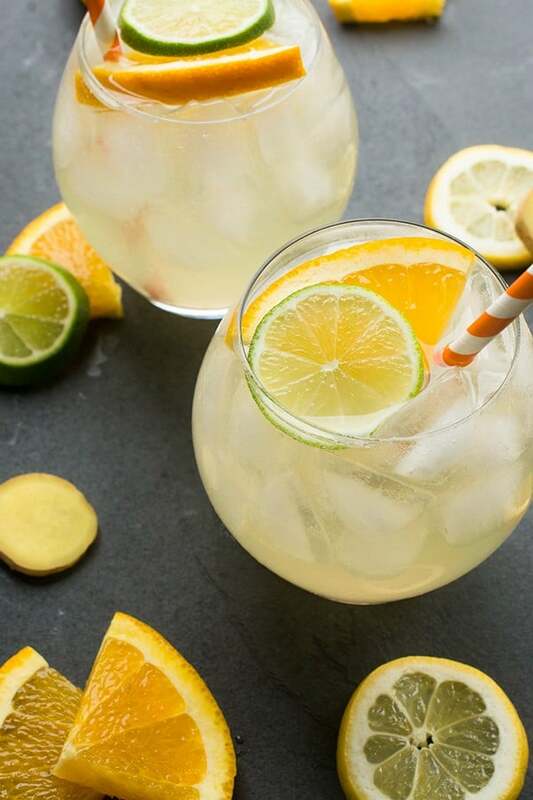 I love ginger and lime anything!! Enjoy! Wonderful idea adding ginger! I’ve never made sorbet before, I’d better get on top of it! This was my first time but I can promise you it won’t be my last!! What a great use of fresh Driscoll’s berries! Thank you Kristen!! We love Driscoll’s! Oh it’s summer here already, I’m currently in my screened-in porch hot as heck, and could sure use a sweet treat like this to cool me off! These are ideal for warm weather!!! Michigan owes us one fabulous summer, my friend! This sounds like the perfect way to kick it off! Love the idea of ginger in this refreshing sorbet! Love me some Driscoll’s berries. This sorbet looks so summery. Love! I just made sorbet for the first time and I’m hooked!! I love the added ginger, I bet it just pops in this beautiful sorbet! haha isn’t it amazingly simple and easy?? 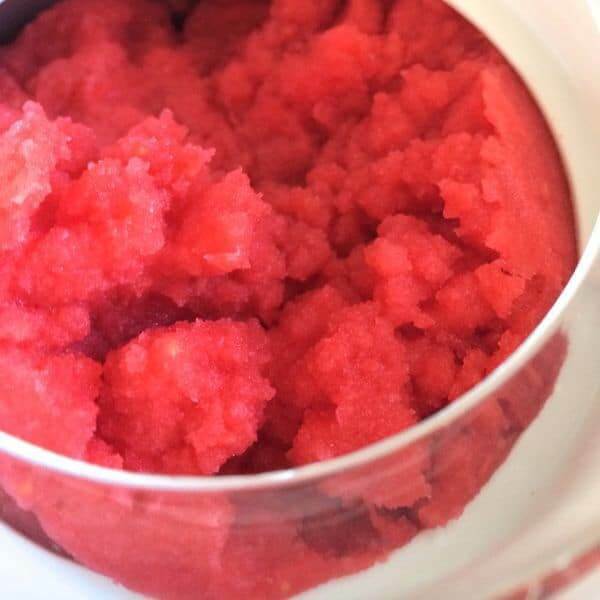 Love the flavors in this sorbet so much, can;t wait to try it soon! I love the combo of fresh raspberries and ginger. 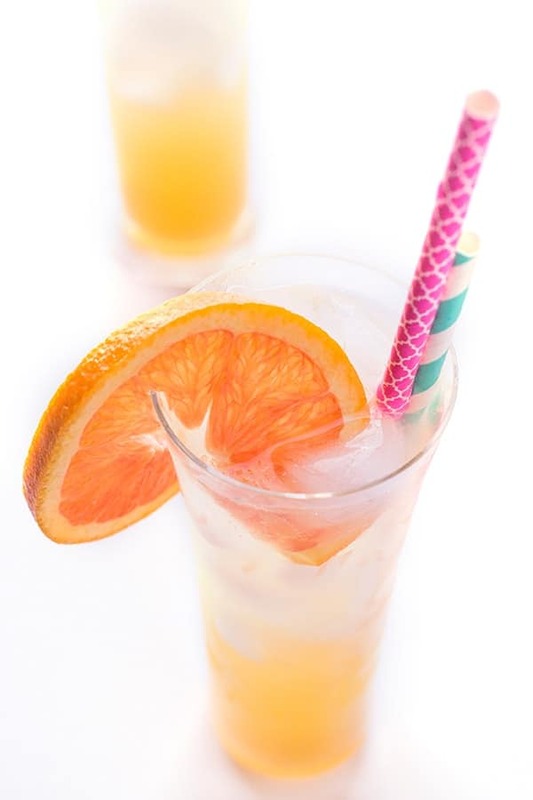 I bet this is super refreshing and perfect for summer. 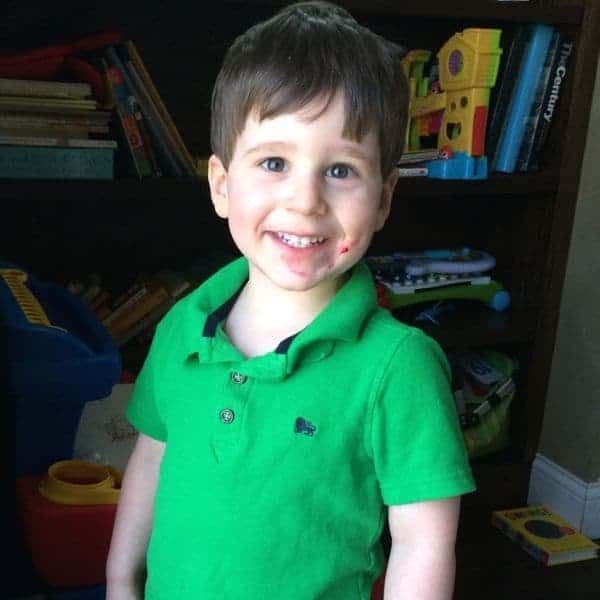 And how cute is Asher and his sorbet face?!?? haha Thank you!! He couldn’t wait to get his hands in it! 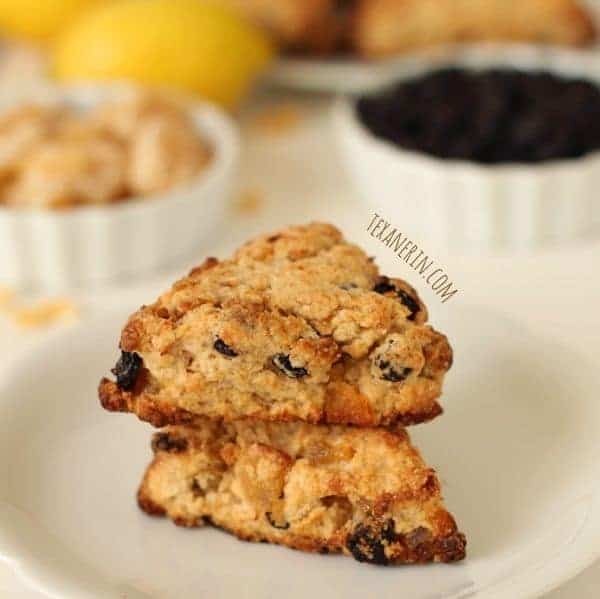 I just love that you added ginger to this – it has such special qualities and flavor!!! I am such a ginger-addict!! This is so bright and delicious! I adore the addition of ginger. My little one will love this sorbet. Raspberries are her favorite fruit. Thank you – ginger and berries are just so perfect together!